"The dogs were almost underwater," said one of the dogs' rescuers. "Within an hour, they would have been dead." 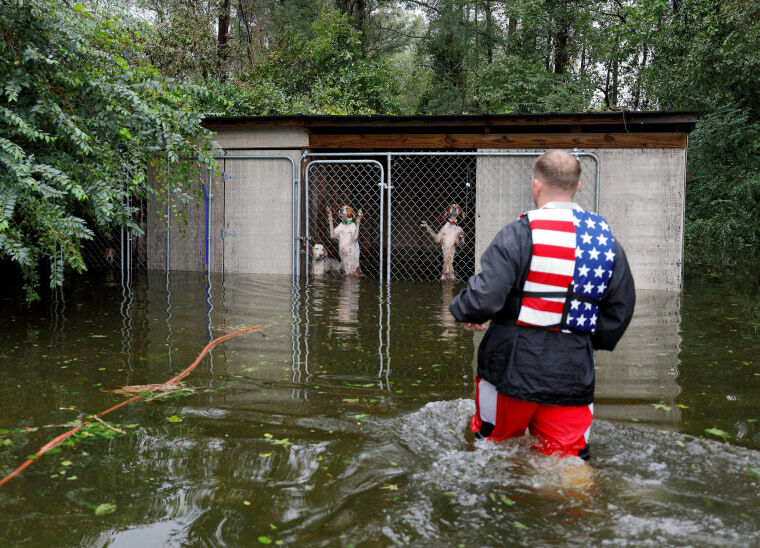 When two volunteer rescuers responding to Florence in North Carolina helped free six dogs from a crate submerged in floodwaters on Sunday, they didn't do it for attention, but attention is what they got — a lot of it. The two volunteers, Ryan Nichols and David Rebollar, along with journalist Marcus DiPaola, were helping people escape from their floodwater-surrounded home in Leland on Sunday afternoon when they heard dogs howling. As the people they were helping were gathering belongings, the three men went to investigate where the noise was coming from and found six dogs trapped in a cage behind a house. "The dogs were almost underwater," Nichols, 27, told NBC News. And the water was rising quickly. "Within an hour, they would have been dead," he said. The men let the dogs out of the cage and let them into the backyard, on much higher ground, Nichols said. Meanwhile, DiPaola, a freelance reporter, shot video, then tweeted it. The video was viewed nearly 3 million times by Monday morning. Many who commented on the post criticized the owners for leaving the dogs behind. Nichols said a neighbor told him that the family who left the dogs includes an 8-month-old, and the family left in a panic between Saturday night and Sunday morning. Nichols, originally from Houston, said he didn't go to North Carolina with the expectation of public praise. His home and business were flooded last year during Hurricane Harvey, but in the midst of his own challenges, he and Rebollar helped other people escape the devastation. "That’s when I decided, when we see a hurricane, we’re going to help," he said. They arrived in North Carolina on Saturday afternoon, and immediately started plucking people from their homes and into boats. "Yesterday, we brought out 25-30 (people), including a 5-week-old," Nichols said. He said DiPaola had asked if he could shadow them, and told the journalist: "If you’re going to go with us, you got to work." While he didn't expect a flurry of public attention to follow the tweet, he said he's glad that "people can see what's what's going on out here." The storm, which has wreaked havoc in North and South Carolina, is responsible for at least 17 deaths. "The widespread flooding is worse than I saw in Hurricane Harvey," Nichols said Monday while waiting in an 80-car-deep line for gas, with the hope that roads would open back up so he could get home to Texas. Another animal savior was also in need of fuel. Tony Alsup posted a picture of his big yellow school bus on Facebook on Sunday with the caption "Rolling to Lumberton and could use help with fuel." Alsup, 51, a truck driver from Greenback, Tennessee, has rescued 53 dogs and 11 cats from the wrath of Florence, according to The Greenville News. He will drop the pets off at shelters around the country. “We take on the ones that deserve a chance even though they are big and a little ugly. But I love big dogs, and we find places for them," Alsup told The Greenville News. He did, to the tune of $3,200, and has been shuttling animals out of dangerous hurricanes since then. “I love it,” Alsup said. “People don’t believe me. They say it’s got to be barking crazy. But no."